Visit Meadowcroft’s historic Pine Bank Covered Bridge during Washington and Greene Counties’ Annual Covered Bridge Festival. 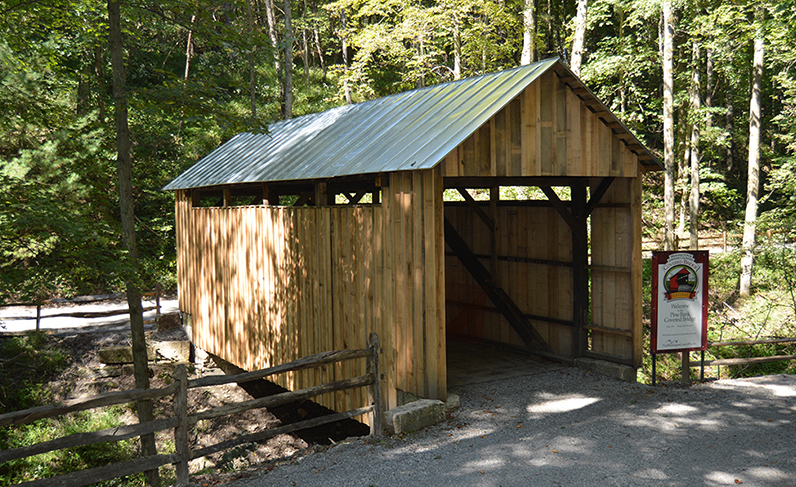 Join Meadowcroft for this free*, weekend-long celebration of covered bridges. Constructed in 1871, the Pine Bank Covered Bridge spanned Tom’s Run in the village of Pine Bank in Greene County, Pa. When it was slated for demolition in 1961, Meadowcroft founder Albert Miller rescued the retired bridge and moved it 70 miles to its current home at Meadowcroft Rockshelter and Historic Village. The pedestrian bridge underwent a rehabilitation project in 2017 and continues to serve as a beautifully restored piece of Western Pennsylvania history. Please note: The Pine Bank Covered Bridge is accessible to pedestrians only. Cars are not permitted on the bridge. For more festival information, visit Washington County Tourism online or call 724-225-3010. Saturday, Sept. 21: Noon – 5 p.m.
Sunday, Sept. 22: 1 – 5 p.m.
*Tours of the Meadowcroft Rockshelter are available during the Covered Bridge Festival for $5 per person.